Mindsight, Daniel Siegel — True stories of real profound changes and healing. I can’t recommend this book highly enough. 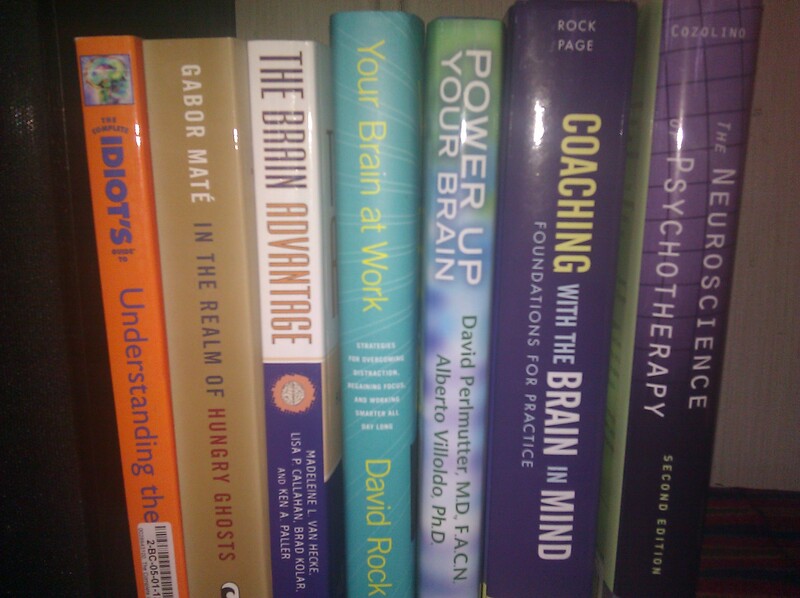 Coaching with the Brain in Mind, David Rock and Linda Paige — I use this for reference. It’s very detailed and complex and perhaps not an easy cover to cover read, but I find it very helpful for looking things up. The Brain that Changes Itself, Norman Doidge — wonderful true stories of “neuroplasticity” and astonishing ways the brain can find new ways to do things. Incognito, David Eagleman — also an easy to read book, lots of true stories about how we know what we know. My Stroke of Insight, Jill Bolte Taylor — a wonderful book about right brain/left brain, written by a neuroscientist who had a stroke. Also see her amazing TED talk. The Art of Changing the Brain, James Zull — this may be the best book on learning and the brain for educators. Your Brain at Work, David Rock — good for leaders, very business focused. In the Realm of Hungry Ghosts, Gabor Mate — fabulous work on the neuroscience of addiction. The Master and His Emissary, Iain McGilchrist — amazing, powerful work on the right and left brain. The RSA video is also fantastic and only 11 minutes or so. How Emotions Are Made, Lisa Feldman Barrett. Mind-blowing research on our emotional life. One of the most important books of the decade.